How did I first find out about MH17? Natalie sent a message to group chat breaking the news to us. I was so hesitant and asked my girl friends to hang in there, let me check, let me check. I turned on the TV, it was all over CNN and BBC. It's confirmed with 298 people on board, not 295. Then, I posted this status. Is my Chinese that bad? Why can't people understand what I was saying? I was really upset with Malaysian media and some Malaysians about the Kiki incident yesterday. Don't you think there's so many more important things to be cared about? I thought this country is so sick that I want to give up on it. that they shot a plane down and realized that it was a civilian plane! My goodness. All we can do now, is, wait. I realized that I've always loved my country and will always love my country. No matter what happens, Malaysia is still Malaysia. To us, it's home, we can't give up on our country. This tragedy will forever leave a mark for us Malaysians and make us stronger. Does anybody get what I was trying to say? This is my personal Facebook profile. 世事無常, look what can happen in just 4 hours of time. One of my best friends from high school. 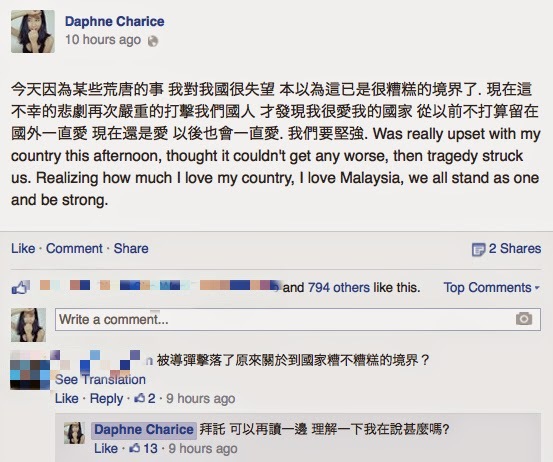 Her mum was on MH370 flight. We used to go to the same church, a religious. She hasn't found her mum, nothing, no answers, her mum just vanished. I don't know how these families are holding on, I'm sorry. I feel very sad, very very sad, it's hurting me, hurting everyone. I was also guilty of a tweet when I was eagerly waiting for Malaysian media to report about it. CNN and BBC stopped their on going programmes and were reporting on it. They were all in English, my mum was telling me to flip to Malaysian channels for Chinese news. I kept flipping on TV1, TV2, TV3, NTV7, 8TV, nothing was on until 12am. I later deleted the tweet because I was guilty of spreading negativity. GUILTY. I said "Nothing on Malaysian media yet. Same old trick. It's all over CNN and BBC." while CNN and BBC are showing us maps and routes. Many always asked me why did I come back. I always tell them that "I love Malaysia". There's the "but", still, yes, I love my country. There are times that I feel this country is hopeless, that I just want to give up. However, Malaysia will always be home. I will never forget my root, my mothertongue (which is Chinese). My accent might have changed but my root, my culture, my belief will never be changed. "This is a tragic day in what has already been a tragic year for Malaysia." regardless of nationality, we're all united in grief." Keep spreading love, it's tough but we will and we must recover. It's not just a hard time for Malaysia or countries that are involved. So many innocent lives were killed. 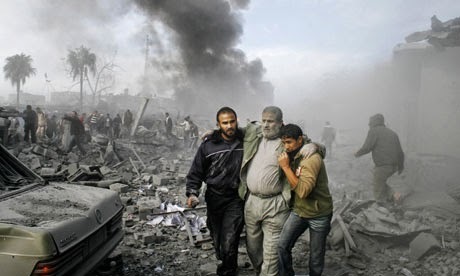 I always wanted to blog about the war between Gaza and Israel. So many innocent lives were killed and are being killed. I do not know how to help. All I can do is spreading love. I've been reading articles about the war. At first I thought that Israel is at fault. Then, I read both sides of the stories. I can't tell what is happening, what is the truth, what I know is what the media is feeding me. 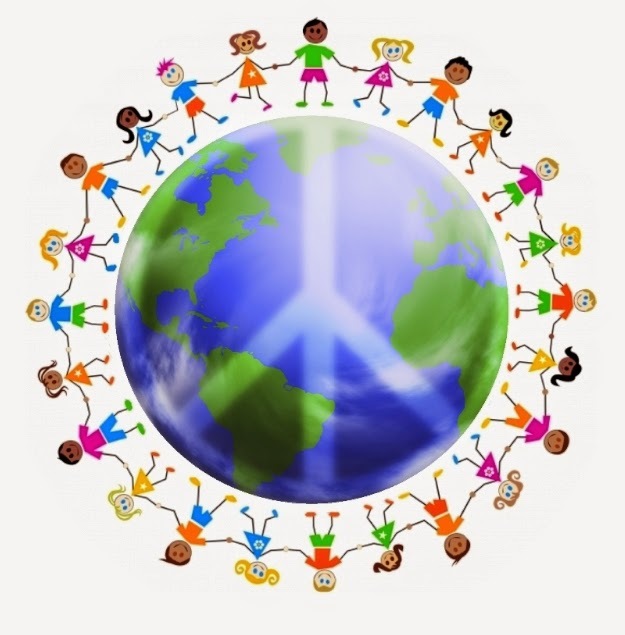 I've always cared about national and international issues but I just don't share much. Cause I don't even know what is right and what is wrong. I'm a tiny media influencer in Malaysia and I need to be careful with what I say. I just really hope that the war would stop. We are all sinners, God. Please save us all, God.